The Rose is an herb! No doubt about it. Every year, The International Herb Association designates a herb as Herb of the Year. 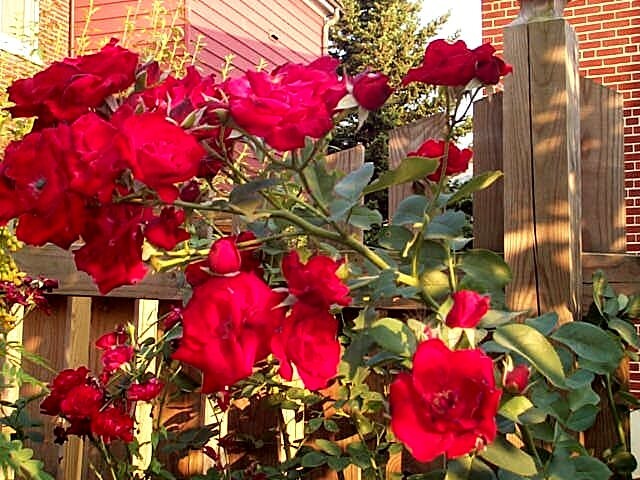 This year features the rose. To be selected the herb must be useful in multiple ways such as fragrant, culinary, medicinal and/or attractive to bees, butterflies and birds. The Rose certainly represents all of those! 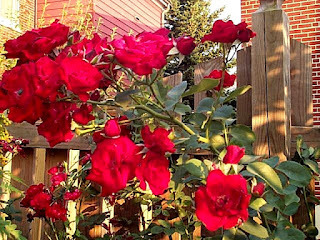 Roses, as long as they are organic, are delicious to eat or drink. We use fresh rose petals in sandwiches (shown below). 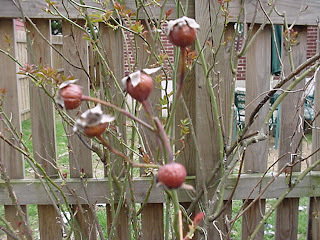 Dried rose petals are added to cakes, cookies or tea. 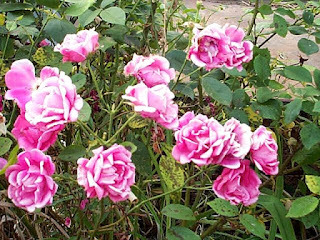 The old fashioned roses have very fragrant flowers and we love to dry the petals to use in pot pourri or in cosmetics. We will also add the rose petals to bath blends and sachet bags. 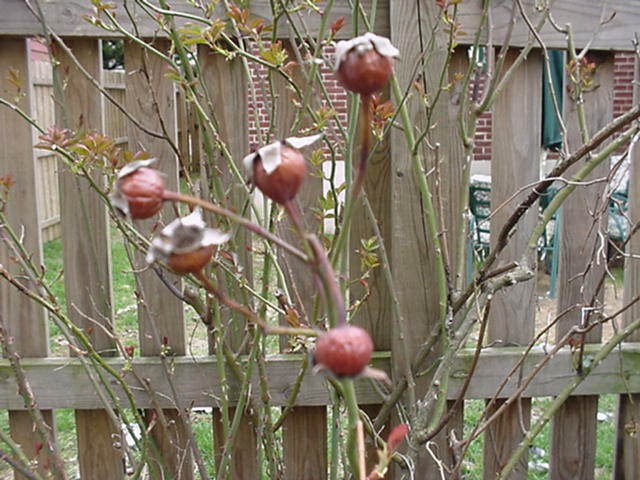 The "hip" or the seed pod of the rose is fabulous in tea, and in fact it is very rich in Vitamin C. In tea, the ascorbic acid of the rose hips gives it almost a citrusy flavor. 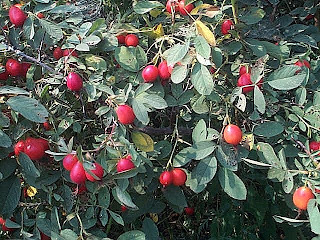 Rose hips are often used to make jelly as well. The Rose, 2012 Herb of the Year! The featured speaker at the MATBA seminar was Drew Sodo Hanson, a practitioner of the Urasenke Tradition of Japanese Tea since 1995 and a licensed teacher in this tradition. Drew owns Boukakuan, a Japanese Tea house and Garden, open by appointment only, and located in Burlington County, NY. In addition, he demonstrates the Japanese Tea Ceremony at Shofuso Japanese House and Garden, a traditional style Japanese house and nationally ranked garden located in Fairmont Park, Philadelphia where he also teaches the Japanese Way of Tea (Chado). Drew explained that the tea ceremony is a social and cultural event where the host strives to serve the best bowl of tea at that moment. And the host also strives to make the guests feel at ease. The ceremony is presented with an open heart and received by the guests with gratefulness. Drew shared the various utensils utilized in the Japanese Tea Ceremony from his extensive collection. In the picture above, he is scooping the powdered green tea (Matcha), using a tea scoop (Chashaku), placing the tea in the tea bowl (Chawan) in preparation for whisking it, using a special bamboo whisk (Chasen). Displayed here, to the right, is a collection of Kogo, or incense containers. Shown below, a plate of Traditional Japanese Tea Sweets, or Okashi, presented on a Sweet Tray, or Kaishi. The study of the Japanese Tea Ceremony is a detailed and continuing process. Tea becomes a meditation, a contemplative time to cultivate your spirit. As you learn more about the tea ceremony, you discover that it is very deliberate and very choreographed so that you focus your mind on what you're doing. It becomes a moving meditation for the guests and hosts where the conversation is very light and mellow but at the same time you are creating a bond between the participants of the tea ceremony. Serving a bowl of tea and reaching out to the guests. For additional information about the Japanese Tea Ceremony, please visit Drew's website, here. A special thank you to Drew for his delightful presentation and informative introduction into the equipage that is used in the Japanese Tea Ceremony. Each tea gathering is a once-in-a-lifetime opportunity. annual spring seminar was held at Gypsy's Tea Room in Westminster, MD this past Monday. Members travelling from MD, PA, and NJ were greeted by Gypsy and her daughter Lora upon their arrival. A delicious welcoming reception that featured a choice of sweet or savory muffins, fresh fruit, and hot tea was a delicious start to an exciting day. Following a very interesting and informative program about the utensils and equipage used during the Japanese tea ceremony (to be shared tomorrow), the members of the Association found their seats in this quaint English style tearoom located in the oldest standing home in Westminster. The beautiful place settings silently announced the delicious tea party fare that was forthcoming. Large pots of Gypsy's house blend, a decaffeinated raspberry tea was placed on each table, although other tea options were also available. The first course featured cubed cheese, slice brie topped with apricot jam and pecans, and pieces of fresh fruit garnished with a cheerful sprig of garden mint. A large, warm lemon poppy seed scone, served with cream and jelly was the next course to arrive. The beautiful tiered tray was presented with an explanation about the delicious treats that were prepared for our group. The individual sandwiches included a warm quiche, salmon and herbed cream cheese on pumpernickel, cucumber triangles, and sliced turkey on a petite bun and a sampling of fresh fruit. The top tier held a variety of little desserts including a shortbread tea pot cookie, a petite strawberry shortcake, and a decadent chocolate truffle. It's always such a delight to be able to sit down and enjoy afternoon tea prepared by the hands of someone else! We enjoyed our escape to Gypsy's Tea Room for not only an educational afternoon, but also a quite tasty afternoon tea. Our desserts featured a thumbprint cookie filled with Elderberry Jam. Elderberry is the best for warding off winter time illnesses. And what better way to take your medicine than in a cookie? The Cupcakes were made with teaberry, a native American herb with edible minty flavored fruits. The leaves make a delicious herbal tea. Teaberry is used as an ice cream flavor and inspired the name of Clark's Teaberry chewing gum. The third dessert served was a Sassafras Sorbet. Yum! Combine boiling water and bouillon, let steep and cool. adding herbs at the end. Suggested spring greens: violet leaves, plantain, chives, spring onion, lambs quarter's. Very Berry Tea a combination of Elder berries, blueberry leaves, raspberries, strawberry leaves, boysenberries, cranberries, lemon verbena leaf, juniper berry, huckleberry and roasted chicory root. Penn Cumberland Garden Club recently hosted their 48th Annual Bertha P. Reppert Herb Tea Party. This is a wonderful event and always one of the most well attended meetings with over 100 attending! Every year the Herb Tea Committee selects a different theme and creates a menu and decorations surrounding that theme. Our theme this year was wild weeds as food. It was called a Wild Thyme Herb Tea. The flower arrangers of the club used garlic mustard and spring onions in the centerpieces and all the foods featured edible plants we often call "weeds" but that are most nutritious. Our speaker was Tina Sams of The Essential Herbal Magazine and her topic was "Making Friends with Your Weeds". Tina shares her thoughts about the tea and additional photos on her blog, linked here. The featured tea sandwiches were: Toasted Weed Sticks, Tansy Egg Sandwich, Chickweed Mini Pie and Red Clover Bread with blackberry spread. The Nettle Soup was probably my favorite part of the menu. Nettle stings when you gather it so it is a challenge to make this soup but it was sooooo good! I could even see this soup used as a sauce on pasta. Nettle is amazingly rich in iron, nourishing for the blood and often used for seasonal allergies. Here's a fun way to serve veggies and dip for a crowd. No need to worry about double dipping with this serving method! The Watercress Dip was served in an individual glass votive with celery, carrot and asparagus sprigs. Leave it to Dr Seuss to teach us an Earth Day Lesson. Happy Earth Day! Care today and everyday! We were pleased to welcome Eliza Blackwell Dupree, a fictional survivor of the Titanic, as our guest speaker for the evening. A captivating and engaging speaker, Miss Dupree drew the audience into the events of this tragic night with her stories and her thoughts. Luxury and increased travel were the hallmark of this era, with travel either by steam ship or by train. There was a First, Second, and Third (steerage) class for both. However, steam ship travel was dependent upon the weather, so an exact date to set sail could not be provided. She also explained about the fashion of the time, columnar shaped gowns, well balanced, and a very large hat. The size of the hat was directly proportional to your amount of wealth. Quite a statement. Last night marked our commemoration of the 100th anniversary of the maiden voyage of the Titanic. In an effort to recreate and experience a bygone era of luxury and leisure, setting the scene and presenting a sense of occasion is just as important as recreating the fabulous foods served on board. Our tables included a scrolled menu, gaily tied with a fresh sprig of rosemary, symbolic for remembrance. Bowls of spiced pecans and sugar crystals along with fresh flowers graced the elaborately decorated tables. Small dishes held the toppings for the scones, lemon curd, clotted cream, and sweet violet confiture. A First Class Titanic Dinner might include nine courses. Our simple fare started with Macedoine de Fruits, a fresh fruit cup marinated in a sweet mint sauce and topped with sugared almonds. Following the first course, we served a Spring Pea Soup, Potage Saint-Germaine. This light soup is made from a puree of fresh green peas, romaine lettuce, and fresh parsley and garnished with a burnet leaf. The menus aboard the majestic liner were heavily influenced by the French cuisine. Our third course featured Asparagus Salad with Champagne Saffron Vinaigrette. The Titanic was noted to be one of the first ocean liners to make fine food a priority, including the best fresh food. Over 800 bundles of fresh asparagus were stored on board. A platter of Canapes included Roast pork with peach Conserve, Canapes a l'amiral (shrimp hor d-oeuvres), and Asperges printanieres (Spring Asparagus Sandwich) with Crystallized Grapes. We served fresh from the oven Traditional English Cream Scones dusted with confectioners sugar and garnished with star fruit to be enjoyed with the clotted cream, lemon curd, and sweet violet confit. No Edwardian meal was complete without a selection of sweets. And our dessert course included Petit Choux a la Almond Creme and a Coconut Sandwich that is known to have been served in the Second Class dining hall. "On the night of the wreck our dinner tables were a picture! The huge bunches of grapes which topped the fruit baskets on every table were thrilling...I stayed at the table from soup to nuts." This week marks the 100th anniversary of the maiden voyage of the Titanic and the fateful sinking of a ship that was widely touted as unsinkable. The book, Last Dinner on the Titanic shares menus and recipes that would have been served on this majestic liner. The authors, Rick Archbold and Dana McCauley offer ideas and suggestions on how to host your own dinner party to honor this historic event. They dedicate this book 'to the memory of all those who prepared and served the food aboard the R.M.S.Titanic'. The ship carried the most advanced culinary facilities afloat. With three huge galleys and a staff of 80, they toiled around the clock to prepare nearly 6,000 meals a day for the passengers aboard. French influenced fare would be majestically presented in the splendid restaurant creating a culinary drama while a hearty stew might be served in the third-class dining area. Preparations for our special event at Sweet Remembrances are underway. Course after course, from Macedoine de fruits to Asparagus Salad with Champagne Saffron Vinaigrette to second class Coconut Sandwiches, we hope to honor those that toiled in the kitchens and respect their dedication to preparing and presenting a sumptuous repast. 'It was a brilliant assembly, contentment and happiness prevailed.' ~First-class passenger Elmer Taylor. In January of 2005, Janet Young of Over the Teacup (shown here on the right) with Nancy and Susanna Reppert of The Rosemary House and Sweet Remembrances, joined forces and founded the Mid-Atlantic Tea Business Association (MATBA) in an effort to help tea related businesses network together, share ideas and concerns, and provide educational opportunities to those interested. We contacted business owners and tea enthusiasts to learn about our new endeavor and to join the association. Our first gathering was held at Sweet Remembrances in June, 2005. our featured guest was Bruce Richardson, author and speaker from The Elmwood Inn. He presented two programs, one entitled "From Bush to Cup - How Tea Gets to You", and on the second day, he presented "What's Hot in Tea". One of the guests in attendance that day was Phyllis Barkey (shown here, to the right of Shelley Richardson). Phyllis traveled from Michigan to attend this event. Although not a member of the MATBA, Phyllis has an enthusiastic interest in all things tea and has recently started blogging. She details her experience at Sweet Remembrances in her blog post today. Please visit Phyllis at Relevant Tea Leaf for her review of her visit to the tea room. The pictures take me back a few years! The sandwich plate for the First Saturday in April included bunnies and eggs and all things spring! There was a rosemary chicken salad, egg shaped cucumber sandwich with French style cheese spread, asparagus sandwich with egg yolk butter, and a carrot ginger bunny topped with sprouts. Scones, of course. And dessert included a lemon tartlet topped with a fresh edible violet, peanut butter filled bunnies atop colorful Easter grass, and an Italian cream cupcake with a petite nest of jelly beans. Festive and fun! Hope your day has been the same! One of our most exotic native American flowers is often considered a world wide symbol of Christ's Passion. 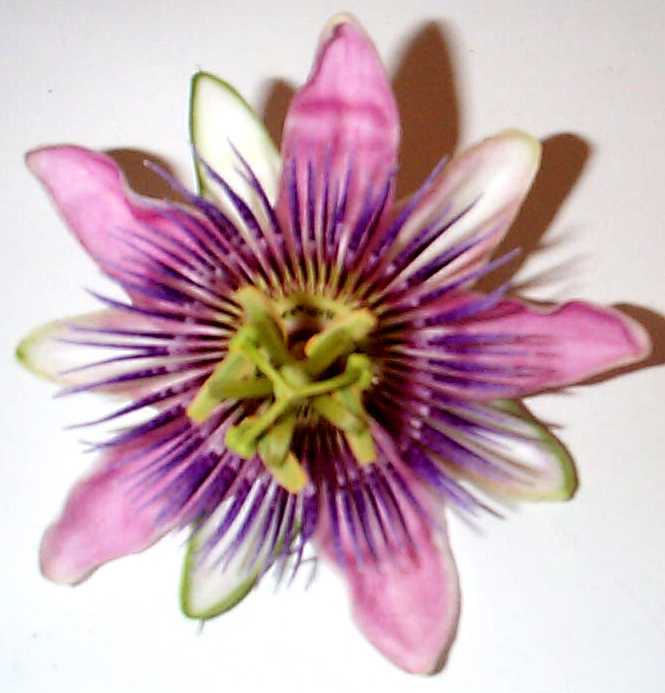 Emblematic of faith and piety, the mystical Passion Flower repeats the drama of Easter in its stunning waxen blossom. This flower is so extraordinarily beautiful that one can understand why the early Spanish explorers and Christian missionaries were overcome by its glory, so much so that they endowed its intricate structure with all the symbolism that has now become an accepted part of the legend of the Passion Flower. The five petals and five sepals are said to represent the ten apostles (excluding Judas and Peter, the doubtful one), the three parted leaves symbolize the Holy Trinity, the three stigmas are said to look like the three nails; each stamen resembles the cross and the arrangement of the stamens together is in the form of the cross. The central column or style represents the pillar to which Christ was bound for the scourging and the many tendrils of this climbing plant are the whips and cords. The leaves are referred to as spear shaped. The double corona of 72 purple filaments which form an exquisite fringe within the flower are representative of the crown of thorns. 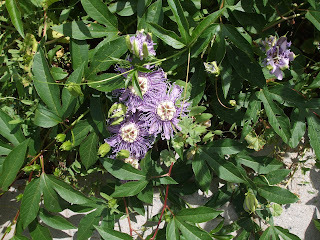 The vigorous growing strong vine is compared to the Gospel and of course the lavender and purple colors of the passion flowers are the colors traditionally associated with Lent and Easter. Gorgeous, Medicinal, Edible, and Symbolic - we are lucky to be able to grow a variety of this plant in our garden! Red Onion Skins - our personal favorite, yields the dark mahogany colors. You can use the same dye bath a second time with another dozen eggs to achieve the lighter russet shades. We usually just boil the eggs and the onion skins together so that we are hard boiling and dying at the same time. You can find instructions and photos at our post called Eggcitement. You can also use: Black Tea (beige), fresh or frozen Spinach (green), fresh, frozen or canned blueberries (blue), canned cherries with juice (pink) and many others. If you don't want to boil the eggs and the dye together - the other option would be to make a liquid dye. You can do this by Bringing 1 quart of water to a boil with up to one or two hand fulls of plant material. Once it is boiling, reduce the heat and simmer for 15 minutes or up to an hour until you achieve the color you like. Strain. For each cup of liquid dye add 1-2 Tbsp. white vinegar to set the color. Place your prepared dye bath in any glass container leaving room to add your already hard boiled eggs you wish to dye. Have fun dying eggs the old-fashioned way!